ECHINODERMATA : VELATIDA : Pterasteridae STARFISH, SEA URCHINS, ETC. Description: Small starfish with short arms. The spines at the edges of the arms are webbed together by a membrane. Colour reported to vary from white through yellow to red. Up to 15cm in diameter. Distribution: Northern North Sea, in more than 100m. Possible record from 36m, Ross-shire. Widespread in the Arctic to southern Norway. 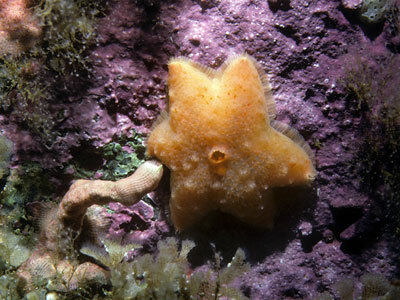 Similar Species: Pteraster pulvillus is similar but has shorter arms and 8-15 branches on the spines supporting the paxillae. Spines at edge of arm webbed by a membrane. Paxillae at surface supported by spines with 2-4 branches. Picton, B.E. & Morrow, C.C. (2016). Pteraster militaris (O F Müller, 1776). [In] Encyclopedia of Marine Life of Britain and Ireland.